Prince Hal (Erik Heger, center) brings together forces, including Falstaff (Richard Ziman, far right) to vanquish Hotspur and defend his father, the king, in Shakespeare Santa Cruz's 2011 production of "Henry IV, Part One". I read Henry IV (pt I) in college, and I HATED it. I thought Falstaff was a cartoon, and that Hal was an over-privileged, spoiled douchebag. I blame the teacher, who systematically took all of the humor and bawdiness out of every bit of Shakespeare's work that we read that semester. He also declared that the histories were "boring". To be fair, if that had been my one-and-only experience reading Shakespeare, I don't think I would have ever considered attending a live performance. After all, Shakespeare is soooooo dry and boooooooring. Thank goodness I had fantastic teachers before and after the disaster that was English 102. Given how amazing all of the other productions at Shakespeare Santa Cruz have been, I decided to go in with an open mind, and I was surprised to find that I really, really enjoyed Henry IV, pt 1. It was not a "boring history" that dragged on and on and on. It was funny and spoke to me on a number of levels. As with all of Shakespeare's work, the characters are incredibly multidimensional, and the acting took it to depths that I hadn't even considered when I read it all those years ago. V Craig Heidenreich plays King Henry IV with command of the stage which I can only really compare to Martin Sheen's opening scene on the pilot episode of The West Wing. (Side note: If you haven't seen The West Wing, do yourself a favor and watch it ALL. From the beginning.) Heidenreich plays a father who hopes for the best for his son, but young Prince Hal is at that age where he could grow up to be a great young man, or a total loser. Now that I think about it, I have the experience of a few extra years, and watching Sam grow up since I read this play, I remember a few years where I wasn't quite sure which path he'd choose. And he didn't have the fate of a kingdom resting on his adolescing shoulders. We see Prince Hal (played by Erik Heger), carousing with Falstaff (played by Richard Ziman) who drinks too much, tells tall tales, and doesn't necessarily pay all his debts. Despite Falstaff's flaws, he's clearly a good friend to Hal. Their relationship, while on the surface looks like it should be more of a father/son relationship, it's more of a bromance. It reminded me a lot of the Alan Shore/Denny Crane relationship from Boston Legal. Hal gets the call to arms from his father, and in the blink of an eye, we watch as Hal makes the decision to man up and defend his father's kingdom. It gave me chills. Heger plays the role where it just seems to scream, "I'm not a loser, I can make you proud!" And he does. 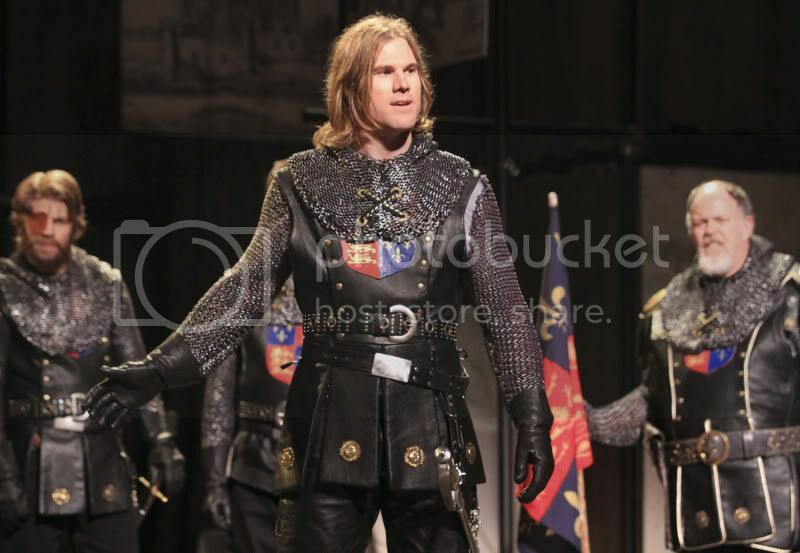 Another notable performance was given by J. Todd Adams, who played Henry Percy/Hotspur. Or, as I like to refer to him "the *good* Henry", who is the young Henry that seems a more appropriate choice for the throne than Hal. You can see both sides, yes, Hal needs to grow up, but young men need *time* to do that. Yes, Hotspur has had his eyes on the prize, seemingly since day 1. We all know who *that* kid is in our lives. If you're in the area, RUN-don't-walk to get tickets to see this production. I couldn't recommend it more. This is my favorite Shakespeare play and I love many of them. I first saw it at Stratford Shakespeare Festival in Stratford, Ontario. I named a pair of pets Hotspur and Lady Percy. It was always interesting at the vet's office when they would call them back. I love the Owen Glendower character, too, although maybe just because I love to say the name. If I were closer, I would buy a ticket. I absolutely love that you use the word douchebag. I used to get in SO MUCH trouble, even as an adult, whenever my mom heard me say it. You made me smile and made me think of my amazing mom. Now I'm going to figure out where I can use that word today!